Since 1994 there’s been an unnatural new player on our grocery store shelves. GMO is short for “genetically modified organism.” It describes foods grown from seeds that have been altered through biotechnology to express certain desirable traits, such as pest resistance. Increasing concerns over genetically modified crops have prompted legislation in more than thirty states, where advocates are calling for clear labeling on all food that comes from genetically altered seeds. Labeling foods containing genetically modified ingredients will enable us to choose to avoid them. It is a policy long overdue. When it comes to food crops, there are three kinds of seeds: ancient, hybrid, and genetically modified (GM). The original seeds, called “heirloom” or “heritage,” are ancient seeds improved over time by selective breeding. Seeds from these plants will be the same from one generation to the next. Hybrid seeds are a cross between two or more heirloom varieties, bred for qualities like increased vigor, greater yield or shorter growing season. Hybrid seeds often bring unique advantages, but saved seeds will not “come true”; they will revert to the parent plants. In both cases, though, humans have been manipulating seeds in these two ways for generations. We have been selectively breeding for thousands of years. The ancestor of today’s corn (“maize”) would not be recognizable as corn. GM seeds take plant breeding to a whole new level; they are an unnatural technological leap that can only be created in a laboratory. Under microscopic conditions, DNA from another species is spliced into the genetic makeup of the target plant in the hope of conferring some advantage. Roundup-ready crops, for instance, are designed to withstand repeated applications of the chemical weed-killer Roundup. Bt crops carry an insecticide (Bacillus thuringiensis) in every cell to deter insect damage. Many crops carry not just one, but multiple genetic alterations, called “stacked” varieties, or “stax.” These are plants that have never existed in nature. In the natural world a firefly could not breed with a tobacco plant, nor a flounder with a tomato, but in the bizarre world of genetic engineering, all things are possible. (Both of these have been done, though never marketed). At present, 85-95% of five major crops are genetically modified: corn, soy, sugar, canola and cotton. At least one of these crops is found in all processed foods. Add 85% of Hawaiian papaya and 25,000 acres of zucchini and crookneck squash and you’ve covered most of the American diet. Unless it is labeled “organic” or “non-GMO,” all prepared foods, from soups to salad dressings to snacks, contain GMOs. In other words, virtually everything in the interior of the supermarket is genetically modified — but there is no way for us to know that. GM grains are fed to livestock in CAFOs (Concentrated Animal Feeding Operations). Carried to its logical conclusion, the supermarket beef, pork and poultry you take home contain the same unnatural genes as does your prepared food. Unless they are specifically raised organically, they too are genetically modified. Biotechnology is a two-part system of engineered plants and chemical herbicides. It’s important to understand each of these systems — the biological and the chemical — their mutual dependence, and the damage they do to our bodies and the earth. 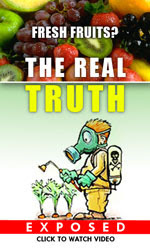 We are told that the alien GM genes in food are destroyed in our digestive system. This is false. Promoters like Agrobacterium tumefasciens and Cauliflower Mosaic Virus spliced into genetic material have been shown to continue to replicate and alter our own genes. We are ingesting DNA fragments that our bodies cannot recognize. They populate our gut, suppress our immune system, lower fertility, accelerate aging, contribute to chronic diseases, and have been linked to infant mortality, birth defects and cancer. Disruption of gut bacteria results in the overgrowth of pathogens, specifically pathogenic strains of drug-resistant Salmonella and Clostridium. A 2011 Canadian study found that 93% of pregnant women and 82% of the fetuses tested had the GM protein pesticide in their blood. Because GMOs have never been tested on human beings, adverse effects are difficult to pinpoint, but they have been observed in mice, rats, hamsters, poultry, pigs and cattle. According to Monsanto, “There is no need to test the safety of GM foods. So long as the engineered protein is safe, foods from GM crops are substantially equivalent and they cannot pose any health risks.” First, those proteins are not safe, because the 40-year-old paradigm of genetic engineering technology is flawed. It is based on the naive understanding of the genome based on the One Gene-One Protein hypothesis of 70 years ago, that each gene codes for a single protein. The 2002 Human Genome project showed that this hypothesis is incorrect. Every scientist now knows that any gene can give more than one protein and that randomly inserting a gene in a plant eventually creates rogue proteins — some of which will be allergenic or toxic. The manifestations in mammalian health are slow to emerge but we are beginning to see them now. Second, they are not “substantially equivalent.” For example, conventional corn has 437 times more calcium, 56 times more magnesium, and 7 times more manganese than GM corn. Tests show organ damage to animals at .1ppm of glyphosate in water; GM corn has 13 ppm. Formaldehyde is toxic in ingestion to animals at .97 ppm; GM corn has 200X that. That is why given a choice, animals will not eat it at all. So much for the vaunted safety of the biology of gene insertion. The other partner in the GM relationship is the herbicide Roundup, the active ingredient of which is glyphosate. The majority of GM field crops have been engineered to be resistant to repeated applications of Roundup, which in theory kills all weeds without harming the crop, thus eliminating the need to cultivate. Instead of driving a tractor and cultivator through the rows to eliminate weeds mechanically, a tractor drags a sprayer that dispenses herbicide. Monsanto, which produces both the GM seed and the herbicide to manage it, claims that Roundup biodegrades rapidly and is practically safe enough to drink. Let’s examine those claims. Glyphosate does not biodegrade; it accumulates in the soil, changing its microbiology and binding with essential minerals, making them unavailable to plants and subsequently to us. It depletes the soil of beneficial bacteria; over an extended period, repeated applications of glyphosate render the soil permanently unfit for crops. It contaminates the water table and poisons adjacent wells. It has been found in waterways where it kills amphibians and other native species. It has been shown to kill butterflies and may be implicated in Colony Collapse Disorder, leading to the disappearance of bees — which we rely on to pollinate our crops. According to a research paper released in April of this year, authored by Anthony Samsel and Stephanie Seneff (Glyphosate’s Suppression of Cytochrome P450 Enzymes and Amino Acid Biosynthesis by the Gut Microbiome: Pathways to Modern Diseases), residues of glyphosate occur across the entire Western diet. Industry assertions that it is nontoxic to humans are untrue. It enhances the damaging effects of other food-borne chemicals and environmental toxins. The impact is insidious and accumulates over time as inflammation harms cellular systems, including the liver, kidneys and pancreas. It has been implicated in obesity, autism, Alzheimer’s disease, depression, Parkinson’s disease, liver diseases, and cancer, among others. Yet Monsanto, Syngenta, Dupont, Dow and the other industry members assure the FDA that there is absolutely no reason to test, no substantive difference between GM and conventional crops, no cause for alarm. Hence we are the biotechnology industry’s walking, talking guinea pigs. Further, glyphosate’s toxicity is spiked by the adjuvants intended to enhance its effectiveness. These supposed “non-active” ingredients in Roundup, like the surfactant polyoxyethyleneamine, amplify the herbicide’s absorption into exposed human tissues. Serious adverse effects have been experienced by agricultural workers handling the herbicide Roundup, including infant mortality and grotesque birth defects. Worse, under pressure from Monsanto, the EPA is proposing to hike the allowed residue limits — yet again — of the herbicide glyphosate in various food and feed crops. The allowed level in animal feed will be 100 parts per million (ppm) and in oilseed crops, 40 ppm. Allowed levels in some fruits and vegetables eaten by humans will also rise. Yet ample evidence shows that GMOs and their chemical burden are harmful to humans and other life forms. What are they thinking? The bright promises that seemed to justify this abhorrent tinkering with the very stuff of life have not materialized. Drought-resistant strains show only a 6% improvement, whereas conventional breeding for drought-resistance over the last 30 years has increased tolerance by an impressive 30%. The cost to buy patented seeds every year and to spray herbicide for weed control have not resulted in savings; U.S. farmers pay about $100 an acre more for GM seed, and crop failures, added to increased pest resistance, are driving many to consider returning to conventional crops. GM crops saw smaller yields globally in 2011 than their conventional counterparts. Worse, the promise of less pesticide use has backfired. Designing a crop able to withstand the assault of chemicals only invites more spraying. Predictably, the indiscriminate overuse of Roundup had led to a dozen resistant weed species; Monsanto is now proposing crops designed to be resistant to 2,4-D, the active ingredient in Agent Orange. Soils sprayed with 2,4-D in the sixties are still poisoning Vietnamese people today wherever the soil is disturbed. Is this the direction we want U.S. agriculture to take? Resistance to the Bt toxin is developing, too. Did we learn nothing from the evolution of antibiotic-resistant bacteria? At the moment, 13 new GMO crops are awaiting approval at the USDA, including Dow Chemical’s 2,4-D Agent Orange corn and the non-browning GMO apple. At the same time, the FDA is getting ready to approve genetically engineered salmon. Approval of Aquabounty’s GM salmon would put the first GM animal on America’s dinner plates — unlabeled. Multiple petitions to the FDA have had no effect, despite the objections of hundreds of thousands of concerned citizens. The same criteria that we apply to pharmaceuticals — that they be shown to be safe and effective — should be applied to genetically modified crops. Are they proven safe? Since no human trials have ever been done, the answer is no. Are they effective, i.e. beneficial? Not in terms of themassive failure of both Roundup Ready and Bt crops, and certainly not in terms of the collateral damage they have done to the environment. GM seeds now threaten human health, animal and insect life and the very life of the planet, all in the name of corporate profit. Congress continues to defer to the bidding of corporations, protecting their interest at the expense of the public good. Unavoidable and uncontrolled GM cross-pollination contaminates conventional and organic crops, putting wild animals at risk and forcing organic growers out of business. GM crops are destroying soil microbes. They are less productive than either conventional or organic ones; they have increased the use of herbicides. They are not the answer to world hunger. These are industry lies. Thierry Vrain, former pro-GMO research scientist for Agriculture Canada: “I have in the last 10 years changed my position. I started paying attention to the flow of published studies coming from Europe, some from prestigious labs and published in prestigious scientific journals, that questioned the impact and safety of engineered food. Labeling of GM foods is required in the European Union, China, Russia, Australia and Japan, in fact, in 64 countries around the world. Labeling will give us the ability to choose what we consume. Please contact your state legislators and urge them to support pending “Right to Know” legislation in your state. Do it for your children. Do it for the planet. Peggy Gannon is an alternative health researcher and owner/administrator of the natural health site, Hawkes’ Health (http://www.hawkeshealth.net). She farms and gardens organically in rural Maine.